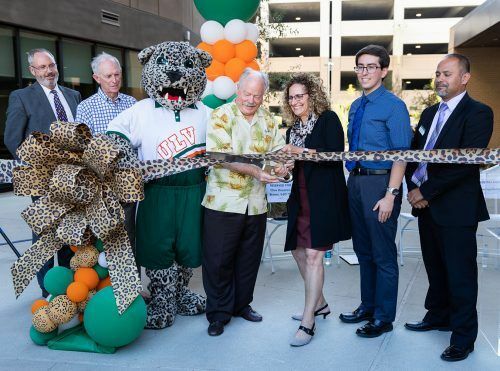 Key members of the University of La Verne faculty and city officials cut a leopard print ribbon to celebrate the opening of the newly completed Citrus Hall dormitory and The Spot dining hall on Sept. 6. The ceremony highlighted the University’s commitment to its core values – ethical reasoning, diversity and inclusivity, lifelong learning and community and civic engagement – in the face of the rapid changes taking place on campus. “Our facilities may change, the coursework may change, but our values and our La Verne experience stay constant,” said University President Devorah Lieberman. La Verne Mayor Don Kendrick thanked a variety of people for helping with the opening of Citrus Hall and The Spot. “Ever since the visionaries created this campus, and it became this institution in 1891, there’s been a connection between the University and the city,” Kendrick said. The most important people at the event are the people who helped pay for and those who are living in Citrus Hall, Kendrick said. Lieberman said that everyone fell in love with the name that students chose for the new dormitory. Lieberman said that Brandt Hall will be transformed into the Ludwick Center for Spirituality, Cultural Understanding and Community Engagement. Davenport Dining Hall will become the Randall Lewis Center for Wellness and Research and is set to open next fall. “It’s a little bit of a golden age that is moving us well into the future,” Lieberman said. After the speech, attendees of the event were given the opportunity to tour both facilities and enjoy catered food. LeoFM was also at the event, providing entertainment and giveaways. Attendees were able to have a caricature drawn of themselves by an artist. Jay Jones, professor of biology and biochemistry, said that The Spot is more spacious and quieter than Davenport. “You can actually have a conversation there,” Jones said. Andrea Prado, a freshman business administration major, said that she has enjoyed her experience living in Citrus Hall so far. “The other dorms were a lot more run down, and you can tell they’ve been used,” Prado said. “Usually when I pass by either in the study rooms or lounge areas I feel like people are hanging out and getting along,” said Panayiota Pieratos, freshman business administration major.